Bronwyn Bonney is Violinist/ singer/ composer for Bronwyn Adams (AKA Bronwyn Bonney) and Crime & the City Solution. Currently she plays a one woman show with live vocals and violin plus self recorded computer backing tracks. She is one of a kind-equal parts magic, innovation, and post punk musings. 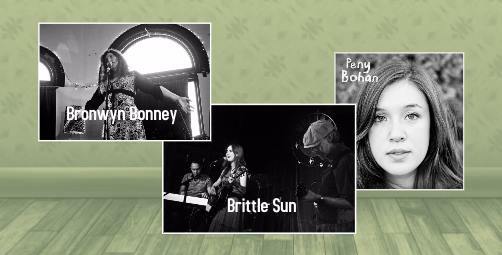 Brittle Sun are a musical trio from Melbourne with their own brand of bluesy garage folk fusion. With soulful vocals that are as fragile as they are powerful, they weave lyrical narrative with stripped back grooves and evocative melodies. Brittle Sun grew out of the thriving spoken word and music scene in Brunswick. They have an expansive, diverse repertoire and their live performances are energetic and fearless.